¶ 1 Leave a comment on paragraph 1 0 As already explained both in the introductory module of this course and the ‘Key Concepts and Definitions’ section within the OpenMed Compendium, the notion of openness in education has many different possible meanings and interpretations, depending on the context and moment in history when it is used. 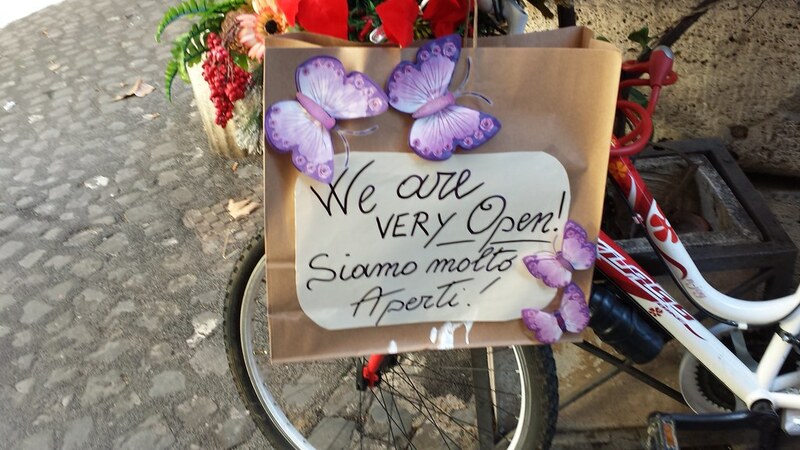 In this lesson we will focus on a more specific term – Open Educational Resources – that has heavily influenced how the idea of Open Education has been understood during the first two decades of the 21st Century. This concept and its acronym (OER) were first coined after a forum organised by Unesco in 2002, which focused on the potential of OpenCourseWare (OCW) for learning in developing countries. OCW was an initiative launched by the Massachusetts Institute of Technology (MIT) in 2001, with the aim of making resources available on the Internet developed by lecturers for students enrolled in courses at that institution. ¶ 6 Leave a comment on paragraph 6 0 The original definition was much more restrictive than this one, as it excluded non-electronic materials and did not consider the possibility of repurposing resources for commercial use. On the contrary, Atkins et al’s (2007) definition detaches the concept from particular technologies and is more flexible from the legal point of view. Within this definition, the key characteristic of resources which are described as OER is that they can be used and repurposed without any cost to users, no matter whether they do so for commercial or non-commercial purposes. ¶ 9 Leave a comment on paragraph 9 0 The word ‘Open’ within the notion of OER is usually interpreted as the absence or limited legal (but also technical) restrictions for users to utilise, repurpose and share scholarly the resources. ¶ 10 Leave a comment on paragraph 10 0 While the definitions of OER above refer explicitly to scholarly (i.e. learning, teaching, research) materials, the Educational nature of resources is not determined by their creators, but by the context of their use. That is, content released under open licences or in the public domain are not only relevant to educators and learners when they have been specifically created for educational purposes. For instance, a news article, a song, a picture or a film might be extremely valuable in facilitating learning within a given discipline, despite not being created for that purpose. In this regard, OER are not just created by educators or learners. ¶ 11 Leave a comment on paragraph 11 0 Resources are assets that can enable some function or activity and when we refer to resources that support learning and teaching we usually think of content (e.g. textbooks, videos, podcasts). However, materials that qualify as resources for teaching and learning might include a much wider range of tools, such as software, data or techniques (as recognised by the definition on the Hewlett report). A broader interpretation of the term could include spaces for either formal or informal learning, and even people as resources for learning. ¶ 12 Leave a comment on paragraph 12 0 Thanks to Creative Commons (CC) and other similar licences (e.g. the GNU General Public Licence) copyright owners can easily grant permission so their works can be used by others without them having to ask for explicit permission. However, not all CC licences comply with the minimum criteria that content must fulfil in order to be regarded as OER. ¶ 19 Leave a comment on paragraph 19 1 Licenses not allowing the creation of derivative works (e.g. 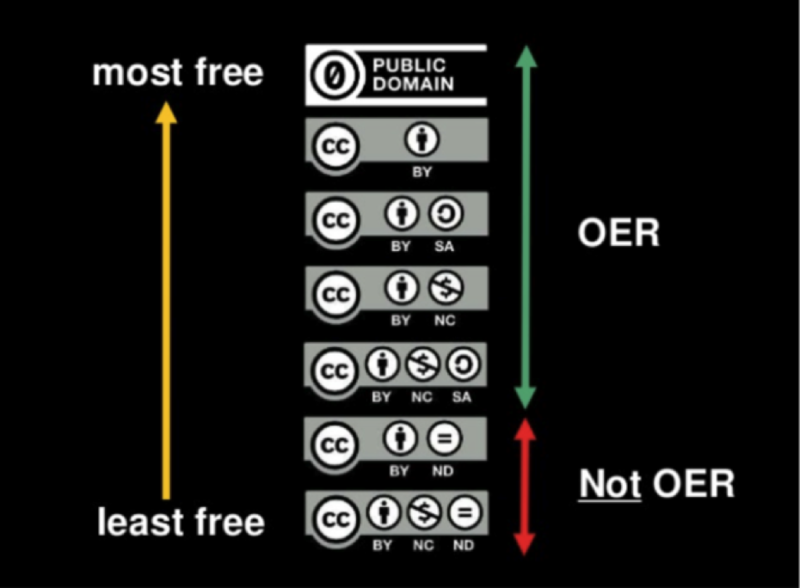 CC by-nd) contradict the third R, the right to revise and adapt content, so such content cannot be considered as OER. ¶ 22 Leave a comment on paragraph 22 0 “Open means anyone can freely access, use, modify, and share for any purpose (subject, at most, to requirements that preserve provenance and openness). ¶ 24 Leave a comment on paragraph 24 0 However, many projects and practitioners recognise NC licences as valid ways of releasing OER. ¶ 25 Leave a comment on paragraph 25 0 It is worth stressing that works released under Creative Commons or any other open licences are still protected by copyright, though the owners only reserve some of their rights, instead of the all-rights-reserved protection automatically provided by copyright. ¶ 26 Leave a comment on paragraph 26 0 Apart from openly licensed content, the other pool of OER content is the Public Domain. When the copyright protecting a given work expires, then it enters into the Public Domain and it can be used as OER. Copyright holders might also choose to dedicate their works to the Public Domain. The CC0 – Public Domain Dedication Tool by Creative Commons makes this process easier to those copyright owner wishing to do so. ¶ 27 Leave a comment on paragraph 27 0 Rather than thinking of open and closed as binary concepts, it is more appropriate to see them as the two ends of a wide continuum that can include different levels of openness (or closedness). That is, resources can be more or less open depending on the rights reserved by their authors, being in the Public Domain the most open possible option. ¶ 30 Leave a comment on paragraph 30 0 While an author’s rights are usually the main aspect under consideration when discussing the notion of openness in OER, there are other important elements that may constrain the ability of users to retain, reuse, revise, remix or redistribute resources. 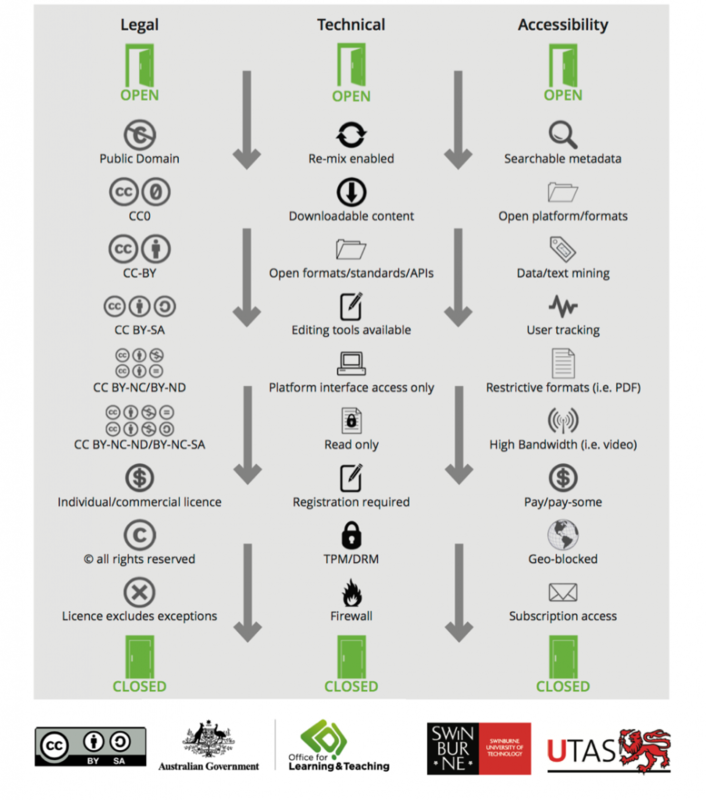 ¶ 31 Leave a comment on paragraph 31 0 The Open Education Licensing project, a joint research and development initiative between Swinburne University of Technology and the University of Tasmania in Australia, has created the illustration below to illustrate different levels of openness around technical and accessibility dimensions, apart from legal permissions. ¶ 34 Leave a comment on paragraph 34 0 While the idea of Open Educational Practices (OEP) will be covered in more detail in the last module of this course, it is important to briefly discuss some key aspects of its connection with the term OER. ¶ 35 Leave a comment on paragraph 35 0 Some authors restrict the use of the term OEP to teaching and learning that make use of content that qualifies as OER. For instance, David Wiley has defined Open Pedagogy as “the set of teaching and learning practices only possible or practical in the context of the 5R permissions. Or, to operationalize, open pedagogy is the set of teaching and learning practices only possible or practical when you are using OER” (Wiley 2017). ¶ 36 Leave a comment on paragraph 36 0 On the contrary, other authors has made the case for a less restrictive interpretation of OEP. For instance, Martin Weller suggests a definition according to which “Open educational practice covers any significant change in educational practice afforded by the open nature of the internet” (Weller 2017). ¶ 37 Leave a comment on paragraph 37 2 In the case of OpenMed, while the project encourages institutions and educators to release content conforming with the 5R permissions whenever possible, it also recognises the value of educational practices that, despite not involving OER, can still help open up learning opportunities to a wider public beyond institutional boundaries. For instance, making scholarly content publicly available on the web (e.g. by means of podcasts, online video, blogs or other types of websites and platforms) can be a good first step in opening up opportunities to a wider public, even if content is fully protected by copyright or cannot be used to produce derivative works. While OER levels of openness are more desirable, making resources publicly available is better than having them behind ‘walls’.